A ford is an inexpensive bridge designed to carry people across bodies of water when they are below flood stage and to survive with minor damage during flood stage. We have studied fords in India and also in many rural parts of California where there is no money to build a bridge. 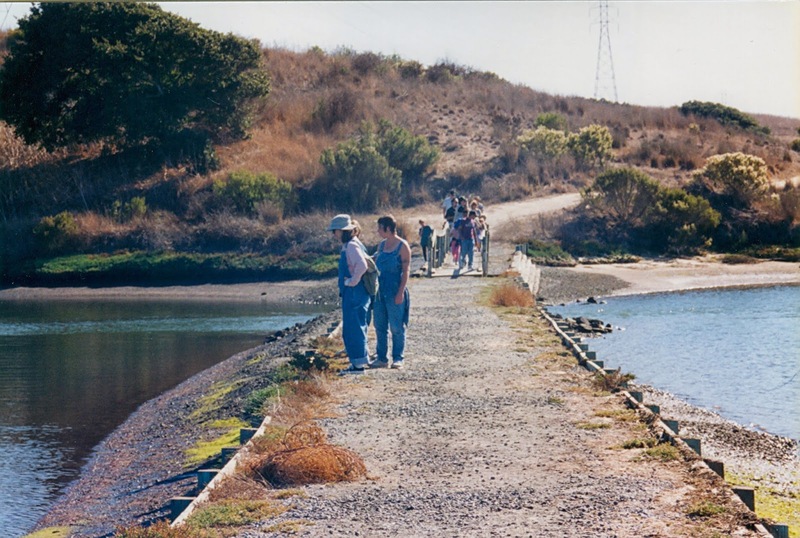 Today's ford carries pedestrians from South Marsh to Hummingbird Island across a tributary of the Elkhorn Slough. We can see a transmission tower from the Moss Landing Power Plant, which is nearby on the beach. Santa Cruz County, California Bridges: South Marsh to Hummingbird Island Ford across a tributary of Elkhorn Slough by Mark Yashinsky is licensed under a Creative Commons Attribution-NonCommercial-NoDerivatives 4.0 International License.